In a large bowl whisk together flour, milk, eggs and yolk, butter, sugar, and salt. Cover and let sit at least 30 minutes. In a medium saucepan combine rice and ¾ cup water. Bring to a boil, cover, and reduce heat to simmer until tender, about 15 minutes. In a deep saucepan combine sugar, 1 cup water, anise, cinnamon, vanilla, and saffron. Bring to a simmer and stir until sugar is dissolved. Add pears and reduce heat to a bare simmer. Poach pears, basting frequently with syrup, until tender, about 20 minutes. Transfer pears to a plate, bring poaching liquid to a boil, and boil until reduced to a syrup. Set aside. In a medium bowl stir together yogurt and honey. Stir rice into crêpe batter. Heat a large nonstick skillet over medium and add ½ teaspoon butter. Pour ½ cup crêpe batter into skillet and tilt the pan to cover the bottom of the pan with a thin layer of batter. Cook until the crêpe bubbles and is light brown, 1½ minutes. Flip crêpe with a spatula and brown second side. Slide finished crêpe onto a plate lined with parchment. Repeat with remaining butter and crêpe batter. 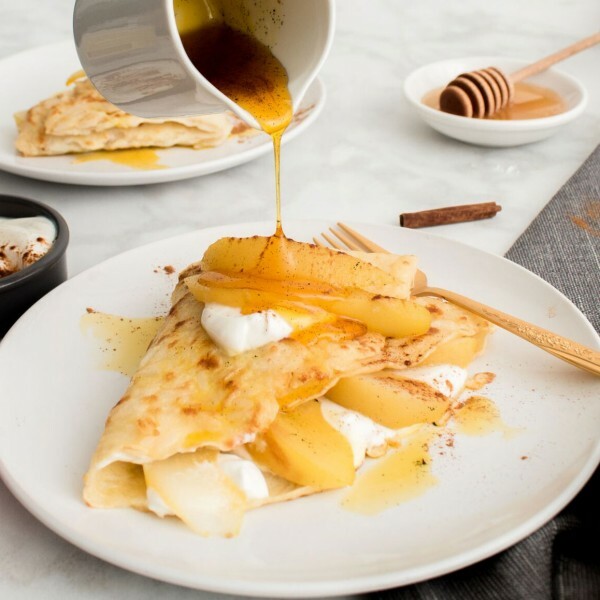 To serve, spread a thin layer of yogurt over ½ of each crêpe. Thinly slice pears and place over yogurt. Fold crêpe in half, then in half again and place on plates. Drizzle with pear poaching liquid, if desired.